Need to find a book to read that you’ll actually love? Hello, Reco! On Monday, I’m headed out on a 16-day trip with stops in 4 different cities…and I need good books to read. If you’ve traveled at all this summer – or, at all, EVER – you can relate. A good book I can read in the tub and fall asleep to in bed, still holding the book in my hand as I drift off to dreamland. Reco has taken the recommendations of your favorite literary-fan friends and monthly book club fellows, and found a place for them all on the interweb, and most conveniently…on your phone. 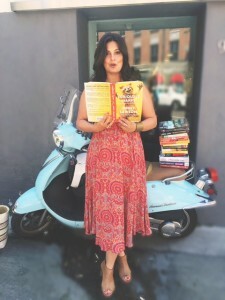 I downloaded the app, loved it, and then contacted the co-founder of Reco – and EVP and strategy officer at Indigo – Krishna Nikhil to learn more about how they came up with this genius idea for the book lovers of the world, like me. DAWN: Krishna, as a book lover, I LOVE Reco! It is SO my jam. What inspired you to come up with it? I feel like I’ve been waiting my whole life for this! NIKHIL: Well, thank you! You know, the inspiration for us was really things that we’ve been hearing both as book sellers and from our customers: that there is really nothing better than receiving a recommendation for a book a friend has loved. That makes you want to read it, and then maybe after you read it, you also want to share that recommendation with someone else. And, personalized recommendation unquestionably makes the best book reading experience, and everyone acknowledges it, yet we all spend a little bit too much time, you know, browsing online and reading reviews from strangers or looking at bestseller lists. So, we wanted to find a way to really bring personalized book recommendations to people in an improved way so that people could just read better books all the time. NIKHIL: This – like so many startups – really began as something on the side. My full time role at Indigo is as our head book merchant. So I’ve got a team of book buyers. We’re the ones who pick the books that we’re going to feature, and do all of the things to make our bookstore amazing. And during the many conversations that we’ve had as a team and with our customers, we saw this opportunity to create something special. DAWN: Which is so important, because I think we know with apps, people –. We joke that if your app isn’t engaging, then you’re going to get apathy. So, putting the “app” in apathy. NIKHIL: I like that word! Our app is really about taking the stress away from your life and just being really easy to use and visually pleasing. DAWN: Okay, let’s get personal. What is your first memory of a reading experience with a book – a reading experience that still really resonates with you to this day? NIKHIL: The one that still stands out to this day is the Hardy Boys series. You know, I had an older brother as well, – like Frank and Joe Hardy – and I sort of always likened myself to the younger Hardy Boy. And, there was just a bit of competing with my brother to see who would get through these books and the entire series as quickly as possible. So, that still stands out to this day for me. DAWN: I so get that. Nancy Drew for girls like me! Now. What 5 books have inspired you that you think everyone should read – or at least have on their bookshelf? But, um, preferably reading! DAWN: Oooh. I love me some magic. What character from a book you most identify with? NIKHIL: That is a really hard one. Whenever I sort of read a spy novel, I try to identify with those characters, but I think – realistically – Aziz Ansari, in his book Modern Romance. I feel like there’s an Aziz Ansari inside of me wanting to break out. DAWN: What was the best gift you have received in book form? DAWN: What is the best rec you’ve received through Reco as of now? NIKHIL: I think you can sometimes have these moments where you don’t realize there are these great books out there that your friends are reading and you want to be part of that conversation – and that’s done so well in other mediums. When you think about the Netflix effect — they release House of Cards [and] every single person is watching and talking about House of Cards. I can’t think of many books where that effect is the same. It’s true when a new Harry Potter book launches, its true when a Game of Thrones book launches. But it’s true of such a small number of books. And what I find Reco is creating in my own social network is a bit of that effect of all of my friends want to be reading the same book at the same time. Like we all went through this recently with a book called The Girls by Emma Cline. Not a book that I would actually normally gravitate to, but I saw so many Recos. DAWN: With your busy life, how do you make time to read? NIKHIL: I think more people need to read for entertainment and for a broad set of reasons versus a lot of people – and I think this is even more true of men – feel like, “Well, when I’m reading I’m going to read a business book or a biography.” People don’t sort of get into various genres and types of books in order to truly enjoy the reading experience, versus it sometimes feeling like work. During the week it is that last thing I do. It’s okay, I’ve gotten everything I need to get done and now I can enjoy this book for – it could be an hour, it could be 15 minutes – before going to sleep. But then there’s also that vacation reading experience where you’re sitting by a pool or on the beach and you just get to kind of soak in the book for a much longer period of time. It might be the one where you’re working but you’re on a plane and you have that time between take-off that you can read. So, for me there are so many different special moments with books that I think it’s amazing. I actually think books are probably the last place we can go to truly unplug and disconnect and as much as what we created is a mobile app and we want people using it on their iPhone, I also just value so much that moment with a book where you’re a bit distraction-free. DAWN: Yeah. Yeah. I think that’s very true. 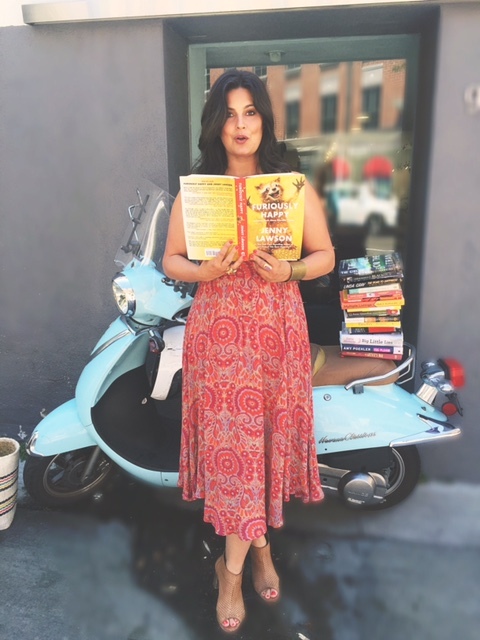 I always say to readers and social media followers that, you know, some people say “I don’t have time to read” and I’m like well, what I do, even if its 10 minutes, I think it’s important to have a ritual with a book. And I personally can’t read on Kindle. I have to have books because if not I will drop it in the tub as I’m taking a bath. NIKHIL: Well, what all the research is telling us is that reading real physical books is better for you in that you retain the plot better, you sleep better when you read a physical book versus an e-book. I think there was just a study I saw today that reading extends your life by two years, and it was a Yale study. There’s also so much on the importance of literary that how it has both health and sleep benefits. All those things. DAWN: Something to remember, something to remember! Fun question: If you could go back in a time machine, what advice would you give your 15-year-old self? NIKHIL: I’m pretty sure my 15-year-old self would not take any advice from me. I think it would just be follow your passion. I think I’ve had lots of different things that I’ve done in my career and education. You know, I started my education as an engineer. That wasn’t really passion-driven. That was, you know, new immigrant to Canada, my parents basically said you’re doing something science and tech. And so engineering it was. But, you know, I also think the journey is what is important and all of those things that I’ve done to date are kind of what got me here. Yeah. Follow your passion. And then it’s about really looking ahead to the amazing possibilities. DAWN: Oh, absolutely. How would you like to see people using Reco? NIKHIL: What we have found is that the most important thing at the start is to follow a few people. It’s a little like Facebook or Instagram where if you’re not following a good number of people then you’re not getting interesting enough Recos into your feed. And so what you’ll see right when you join is a list of people who we think are making some of the best all-around recommendations, and then also some people that are handpicked for you based on what you selected as your interests are. So if you selected when you join up, “I’m interested in celebrities, self-help and art” then the app will show you users who share those interests so you can follow them. So, right out off the bat if you follow eight to ten people your experience on Reco is for sure going to be better; you’re going to get some really interesting books in your feed, and then you can decide whether you want to add more people or unfollow some. So, that’s the number one thing. The second one is to put some recos out in the world and there’s two ways to do that. One is to say you love this book, share it with a short little blurb, and the other way is to create a list. So, we’ve had a lot of people creating the five best books to read this summer. It’s another way to get onto the platform and share and engage and, you know, it is like any social media platform. You get out of it what you put into it. DAWN: It has been SO good dining and dishing with you, Krishna. And, well, I’d better go…because it looks like I’ve got some reading to do! *This is a sponsored post in collaboration with Reco. While products or compensation were provided, the words and opinions are all my own. I never post about something I don’t believe in 100%. That’s just not who I am. Thank you, Reco, for letting me – an avid book lover – try out and promote your joy of reading-inspiring app.